Few details about the capping and relocation of the landfill emerged, however, when the MLAs voted $3.6 milllion for waste collection services. The increase in the cost of managing government properties from $11.4 million to $15.7 million was said to be mostly as a result of the new Government Office Accommodation building, and the increase in revenue from government to the national mail service by some $300,000 was down to a decline in stamp sales which is where the bulk of the post offices revenue comes from. During Finance Committee all member of the assembly get to ask questions and grill ministers, chief officers and managers of various government departments about their budget allocations. It is also an opportunity for the members to raise any problems their constituents may have with government services and departments. Farmers ID cards, electrical problems at the North Side civic centre and tide forecasts by the weather services were just some of the issues members were questioning on behalf of their constituents. In order to complete the work this week members are sitting late into the night to scrutinize the budget appropriations which are now available here. Reduced stamp sales. Oh my I wonder why – these are technological times people and there are less expensive and faster methods of communicating without all the red tape of the Post Office and believe me there is red tape at the Post Office – the post master general knows how to create that LOL. Increase in Motor Vehicle Fees?? 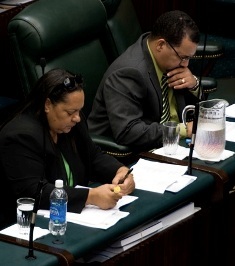 Did I hear correctly that yesterday in the LA that the Honourable Deputy Premier informed the representative from North Side that the Government will be taking up his suggestion to increase Motor Vehicle licensing fees when the new Traffic Law is presented to the House in September 2011? If so, should they also now take up his suggestion and remove the additional 25 cents duty on fuel at the same time? Why is there $71,000 allocated to Youth to Youth?? When was the last time this program was up and running??! In a developed country its called doing what your good at. Its called going to work. Its called running the country. Here its called showing up.